My mornings start out at 6:00 AM. On days when I have post going live, I'll be blogging away for about an hour, on days when there's no post Gary and I like to get a quick run in - it's about the only time we have together during the day. I have a pretty big client event taking place in a couple months and I've been going to the venue quite a bit, today's agenda includes meeting with the caterer to go over some logistics and it's going to be super hot, did I mention the walk through is outside?!! With such tiny quarters I have to be creative with my makeup setup (thankfully not for long since we're moving), but I let Gary take care of breakfast & coffee while I get my "face on" if you will and get ready for the day when I really need to be bold! I don't change my purse out every day, but I do like to make sure the essentials are in there, especially when I'm not going straight to the office. Having bad breath is one of my biggest fears, specifically when I'm meeting people for the first time so I'm always carrying mints or a travel size mouthwash with me to make sure I feel like I just cleaned my teeth throughout the day, especially with all the cold brew I've been drinking. With a CVS practically on every block here in Boston, no joke I pass three on my daily walk to work, I can pop in when I'm out of any of these, but especially the smaller sizes of the LISTERINE® Antiseptic that I can keep with me at my desk and it has to be the cool mint variety for the after taste. I like that they are strategically placed right near the candy - make sure you hide the evidence of cavities with brushing and rinsing - ha! About mid-morning I'm back at my desk and looking forward to crossing lots of items off my to-do list!! Some days I hit the gym at lunch for a spin or tabata class, but thankfully I was able to catch up with a friend over lunch! I'm not sure about you guys, but I would go to Bolocco at least twice a week, but after the whole Chipotle incident, I stopped going and seriously missed Bolocco. I'm happy to be back with my old friend! A few meetings, a couple items crossed off the to-do list and it's time to head home around 5. We've been all about salads during the week - they're just easy to throw together and we add some sort of protein to it. For the last few months, Gary has been making it home about a half hour before me and he's been rocking at making dinner! Does anyone else feel like the fly through dinner?! This is the second part of the day that Gary and I get to connect - for about 30 minutes until it's right back to work. Jackie and I are hosting, together with VS Photography our first Bridal Pop Up Event taking place in August and we've been trying to find an hour here or 20 minutes there to all chat about it. For some reason 7:00 - 10:00 PM fly by! The TV is usually on and the laptop is firmly placed on my lap! Usually I'm working on blog posts, business things or contributor posts - recently we've been planning our trip to Nashville so I've been trying to find an AirBNB to book! Finally at about 10:30 PM it's time for my favorite thing - getting ready for bed! I begin and end my days with a great rinse. Even after brushing I can use the extra clean feeling and knowing that it's working while I'm sleeping to ward off plaque and killing 99% of bad breath germs (some that are missed by just brushing) makes me feel like I'm being productive even in my sleep. Then I literally rinse & repeat the next day! What's a day in the life like for you? Any one thing you look forward to? #adulting -- this post! Lol!! I always fly through dinner thats so funny that you said that because thats exactly what I do! And yes 7:00 to 10:00 always fly by for me too! It is beyond crazy how fast our days go! Happy Monday! Girl you work hard for that money! Get it Monday! I look forward to my evening walks. It's my quiet time, no music playing or talking on my cell phone. I also love waking up and making a pot of coffee. My morning usually starts with the coffee pot going and then I sit and read posts by my favorite bloggers. Yes, that old Donna Summer song is playing in my head as I read this "She Works Hard For The Money!" LOVE day in the life posts and yes, the time in the evening when you want to relax and unwind....gone in the blink of an eye!! Here's to Monday flying by!! These posts are so fun- love learning more about ya! Side note: your planner is too cute!! Have a great week! I love these posts!! So fun to see your day!!! I love to know what other people do. This was really cool. You sound like me... I don't know where half of my day goes sometimes and before I know it its 10p and I'm like time for bed. I've been working on a day in the life post, but collecting the pictures has proved to be difficult, hope you have a great week! I am so with you— bad breath makes me self conscience so fast! I swear by the Listerine breath strips and always have some in my bag! I always think the night flies by once my hubby gets home - although it flies by during the day too! I always say we need more time :) That's so sweet Gary gets dinner ready for you guys! And yes, Listerine is a MUST! Yay! I love day in the life posts! I guess now I know how you fit it all in :) Love that planner! So cute. Day in the life posts are my favorite! I totally agree the evenings just fly by - I love how much you are able to pack into your day! I love how creative you are with your make up mat over the sink to give you more space. Luckily I have a counter now, but I sure could have used one of those back in the day! I usually don't get home until 6:30 pm and I have to agree, 7:00 pm to bedtime just fly right on by like it is nothing!! I wish three hours of my work day went by that quickly. Hahaha. Have a great week, stay cool out there! You are one busy lady! Loved seeing a day in your life. Have a great Monday! So exciting to be planning and hosting your first event! 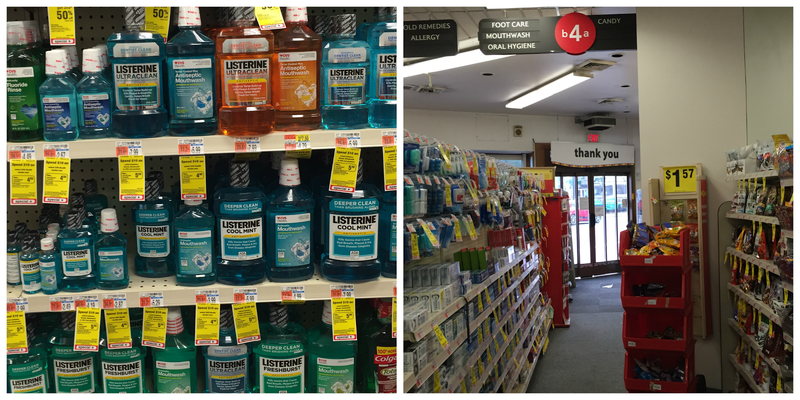 Crest has some little one time mouthwashes that made perfect stocking stuffers last year. I am so paranoid about bad breath too. My boss drinks V-8 every morning and I"m telling you...it's terrible to be stuck near her right after. Eek! Hope you have a great week. That pocket-sized mouthwash looks perfect. I didn't know they made a bottle that small. Also, your salad with the shrimp looks amazing!! Have a great week! I love these sorts of posts - it really makes you look at how you spend a day. yeah! i love day in the life posts. you're so organized i love it :) and isn't it interesting to see everyone's routine? like a sneak behind the curtains :) and seriously good breath is one of the most important things in life, so it's good to take care of that all day long! You go girl, haha! You definitely keep busy! And yes, 7-10 pm is gone in a blink! Love these "day in the life" posts! You have quite the busy work day! I'm trying to learn to get blogging stuff done in the evenings after work, but usually I'm just so tired that I put it all off until the weekend.... But you've inspired me to keep trying! I always love peeking into people's day! I actually love your makeup setup - I've never seen that little black thing to cover up the sink before! Those hours at night always fly by in our house too - why, why why! 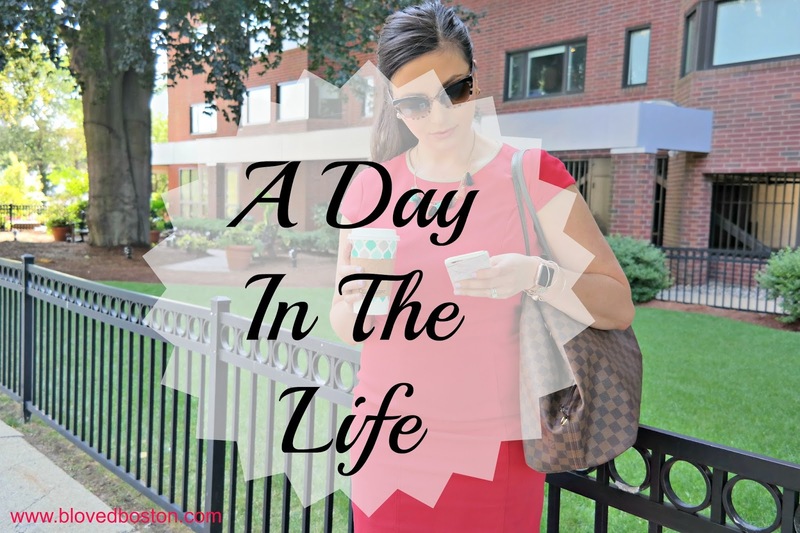 I always love these "day in the life" posts! Yes, why is that 7pm-10pm fly by?? Hope you have a great start to the week! I always love hearing about people's days. It's a good window into who they are. thanks for sharing! We have been all about salads lately too. It looks like an eventful day, you do so much! I always look forward to eating and sleeping. That's pretty much it. Haha! I love reading routine posts like this! I'm such a creature of habit so I love seeing how everyone else spends their every day! That shrimp dinner looks AMAZING! SOOOO< when is the Nashville trip? It's sooooo close to me I'd totally love to meet for dinner or something. Love your planner and how you schedule workouts, go girl! Looks like you have a busy schedule! Thanks for sharing! I didn't know about the little mouth washes! What a great post and makes me want to do one like this myself, soon. I loved when you did this type of post last year too. Your work day is busy. I had no idea they had small/travel size listerine rinsers but I will get one for sure. Also girl that salad that Gary made looks awesome and I am hungry now. Happiest Monday to you and good luck with your big things coming up at work! love this post and love that you and Gary spend time together before the day starts! We need a Bolocco date soon- their bowls are amazing! Have a great Monday!! I love day in the life posts! I totally remember seeing bolocos when I was in Boston but I don't think I really knew what it was! I wish the evening hours could sloooow down sometimes, they really do go by way too fast. You really are a busy lady, Biana! My brother swears by this mouthwash, he works for a dentist, I can't use it because I have super sensitive teeth so I have to use something else. Hope you have a great day, Biana! I like reading this kind of posts. I always use Listerine after brushing my teeth. You are busy! That is a jam packed day for sure! I love my Listerine, can't live without it! Love reading these posts! I am currently at a work training so by the time 5pm rolls around I can't wait to get back to my babies! I absolutey love reading posts like these! I always make sure to carry either mints of travel-sized mouthwash in my work purse too! yay for minty listerine! I'm a huge fan of those pocket pacs too. I've never been to bolocco! We seem to have a CVS on every block here too! I love posts like this. You are an active lady and so well prepared! Sounds like the perfect day!!! That salad looks amazing. Evenings completely fly. I look forward to them and also to my first iced coffee of the day! I love these day in the life posts! Always so interesting to see how people allocate their 24 hours. :o) Have a great week, Biana! I love how grownup everything is with this post! :) Your days definitely are jam packed, but it seems like you love what you do so that's always a plus! I no joke just walked out of the store and bought this same Listerine haha! It's definitely a necessity for me! Fresh breath! Yes please! I love these posts. It's cool to see how someone else goes about their day. It always strikes me too just how much time we all spend on our blogs lol. Happy Monday! Day in the life posts are my favorite! I'm so nosy ;) Good for you guys for running in the morning! I'm the same way where if I don't work out first thing, it's not happening! I totally agree 7-10 are the fastest hours of the day! You sure do stay busy. And I haven't had Bolloco in years, there isn't one in NC and I miss it. I are there constantly in college! Girl I don't know how you even manage blogging!! Your day is so busy, and you're getting in exercise in regularly. I usually can only make it on the weekends for working out. I love that planner - which brand/where is it from? I'm looking for a new one! Love it! That shrimp salad looked too yummy - might have to be my dinner tonight! I love reading about other people's days and routines...it's so interesting to me. I need to get up earlier and become more awake before driving to work...haha. I am going to attempt to read some blogs in the morning before work with a few cups of coffee-you've inspired me to try it out! Nice! Well organized your makeup tools! Looking great! Thank you for letting us in on your schedule. You seem to be very organised. I'm sure your days are mostly productive. You have so much going on and are so organized! Connection with your other is so important, so it's good that you make time for each other. Your day sounds so organized and productive!! I love these types of posts. You are so organized lady! And I agree, the evening hours always fly by. I love the day in the life series. Always so much fun to read them. ooh a trip to nashville, how exciting! i love day in the life posts, that salad looks delicious! we have been trying to eat salads with dinner each night, good way to get some greens in when we otherwise wouldn't. you are definitely a busy lady, good thing you're so organised! So true about CVS being on every corner in Boston... A fact I always appreciate, lol!! Love your planner!!! Do you work in event planning for weddings now? The last time we met at the Blog and Tweet Boston Event you were working for a law firm but it sounds like that changed? Either way, you sound like a busy woman! Salads are always a great quick dinner. I have been loving strawberry and goat cheese salads and have been making them all summer!